My painting teacher always told me to work large. The theory behind this is simple: Working at a larger scale with larger brushes helps a beginner to paint a little more loosely, and hopefully not get too bogged down with the details. It can also make any details easier for a novice with a paintbrush to navigate. As you grow more proficient, you learn what details are necessary, and which ones can be left out. This helps a lot when working at a smaller size. However, one thing that painting large as a beginner might not help with, is finishing a painting. Reflecting on this, I think it often boils down to lack of colour mixing experience and not using enough paint. The last thing a beginner oil painter wants to do is use up tubes of precious paint whilst trying to mix the right colours. Oil paints are not cheap and understanding how to mix up that very specific shade of seagull grey, beagle brown or orangutan orange can be, quite frankly, about as tricky as finding a seagull, a beagle and an orangutan in the one location to paint. You hesitantly squeeze out a few micro dobs of colour and start mixing. The stars align, and you have the perfect shade of orange for your National Geographic Award-winning primate painting. The orangutan starts to take shape on your canvas but… oh no! You haven’t mixed enough paint and now you need to replicate that very orangutan-esque shade of orange. This time, the stars are not so aligned. The orange is almost right, but not quite. Painting has now become a ‘Choose-Your-Own-Adventure’ story: Do you keep using up more paint trying to replicate that orange? Or do you take a risk and use your ‘near enough is good enough’ shade? The stars move completely out of alignment. Your attempts to improve the new shade of orange turn to custard. In a last ditch effort to actually make progress on this wretched painting, you convince yourself that the orangutan would look good wearing a custard coloured vest and against your better judgement, you use your poorly mixed shade of orange. National Geographic awards are for creative sell-outs anyway. The stars turn into a meteor shower and destroy the earth. Exhausted and just a bit peeved, you leave the painting for another time. But the next time you pick up your brushes, the mere sight of the custard-vested primate churns your stomach, so you choose to begin a new piece (a beagle perhaps?). And so the cycle continues. I have never painted an orang-utan, but I have certainly cast paintings aside because they were taking too long. Mostly, this was just down to being an utter newbie at colour mixing and/or stingy with my paint usage. This is where painting small can be really helpful. Start small, and start simple. By small, I mean something A4 size or less. Choose a subject matter that won’t be too draining to decipher and mix up enough colour to complete it in one hit (this will get easier to work out the more often you paint). Of course, the size of your painting won’t make colour mixing miraculously easier, but if you’re scared of wasting paint, and tend to only mix small amounts of it, then this reduces the likelihood that you’ll run out half-way through and need to remix more. Painting small also allows you to cover more surface area quickly, which helps boost motivation to persist through to completion. It may sound obvious, but I really believe the more quickly you can paint, the more likely you’ll finish what you start. And just finishing a painting can be a huge motivator to go on and finish the next one. It hardly bears saying, but the more paintings you do, the more practice you get, and the less scared you become of wasting paint - because your colour mixing improves. And this is when you can move up a size or two… the benefits of which I’ll explore in my next post. In the meantime, what are some of your biggest painting blockers? If you’re not a painter, what stops you from completing projects that you choose to work on? 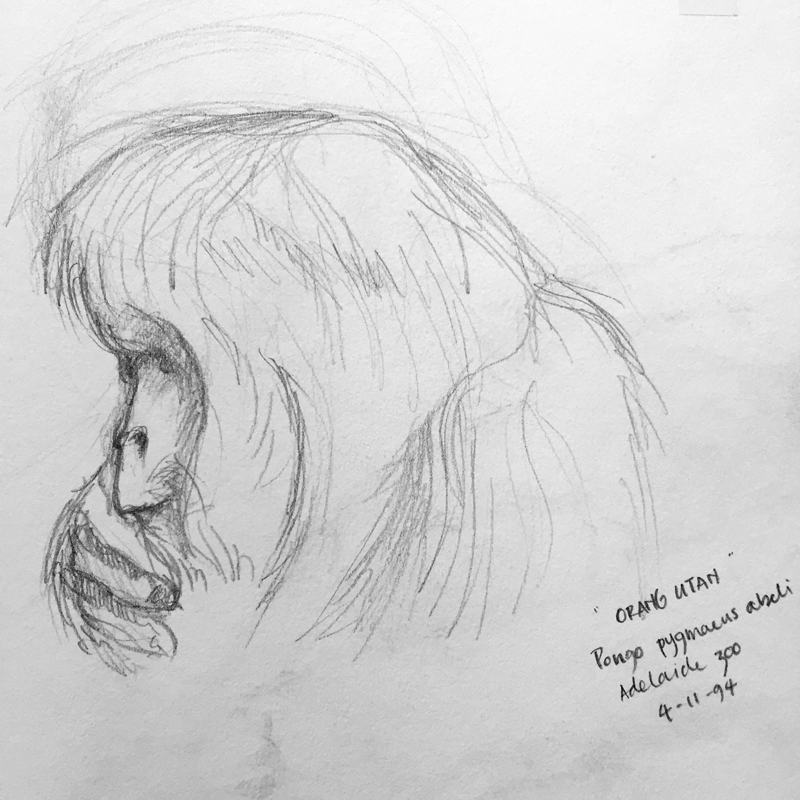 I may never have painted an orangutan - but I found a very old sketch I once did. Will that do?